Tough, almost unbreakable housing protects bulb. Bulb included, lasts up to 7 years. Cooler bulb, safer to touch. 12 amp grounded outlet. Spot light top. Hang it, stand it or hold it. Similar amount of light to a 75 watt incandescent bulb but with daylight color (7000 Kelvin). 6 foot, 16/3 SJT cord. UL listed. Aluminum 8-1/2" diameter reflector. Protective vinyl covered grips, full swivel head. Polarized. UL, cUL Listed. Trouble light with 6 foot 16/3 SJTW cord and 120 volt outlet. cULus Listed. Shatter-resistant polycarbonate lens. Durable ABS LED housing. Magnet on back and bottom. 120 degree beam spread. 2-way charging, AC and DC. 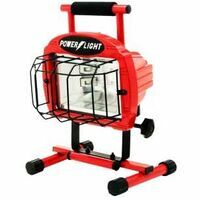 3 watt work light, 1.3 watt spotlight. Both have 5-1/2 hour runtime, 100 lumens, 80 CRI and 4000K. Patented dual hook system, hang by the guard or handle. Heat resistant housing stays cool even with short neck bulbs. Round flexible vinyl jacket. 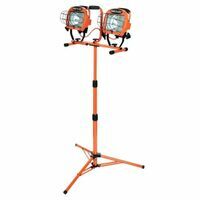 Meets OSHA specifications for temporary lighting. UL rated for 75 watt maximum bulbs. UL Listed. Orange cord. Sleeved. Swivel hook, shatter-resistant polycarbonate lens, 15 amp U grounded outlet, Durable rubberized casing. Powered by 6 foot AC cord. SJT 18/3 6 ft, (110v to 240v). Uses only 6 watts. 400 lumens, 80 CRI, 5000K, 120 degree beam width.